Coatings, Glue, Foam There are 5 products. Rigid and soft foams, foam glues, and a complete system for coating and texturizing your foam projects. Amazing new brush-on encapsulant with fast set time. A super thin coat provides an impact, water, and fire resistant shell for EPS foam and Styrofoam. 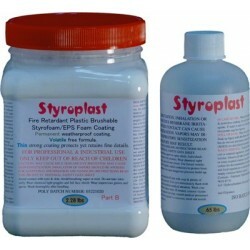 Styroplast will outperform all other coatings. For industrial use.